As a coach and mentor to thousands of athletes over his career, Marcus Newsom has pushed his athletes to persevere during times of adversity. He believes the most meaningful lessons in life come from tough times. 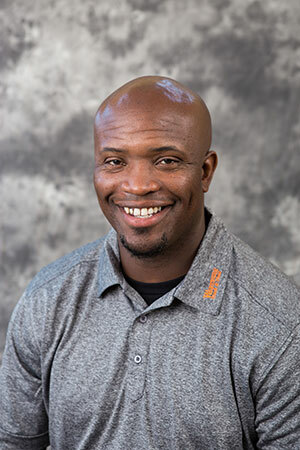 Newsom is the head men’s and women’s track and field coach and assistant athletic director at Wartburg College in Waverly, Iowa. Under his direction, the women’s track team has won 29 consecutive conference track and field championships since 1999, and eight national championships. The men have won 16 conference titles. But Newsom doesn’t measure success by titles or trophies, he measures it by character, scholarship and attitude. He recruits students based on these attributes because he believes that’s what makes them good athletes. As a student in the Kansas City, Kansas Public Schools, Newsom had his share of challenges. His father left when he was five, and his mom worked hard to support the family. At Schlagle High School, Newsom played football, wrestled and ran track. He had a number of teachers and coaches who gave him reasons to believe in himself. Mrs. Fields, his English teacher, taught him how to write – a skill that was invaluable to him in college. Coach Randy Westfahl mentored him as a player, but also served as a father figure. And athletic director Mary Stewart taught him and the other athletes to be “good young men of character.” However, his mother was his biggest mentor and supporter, and the best coach he has ever had. “She taught me to work hard, have a positive attitude and to always have faith, and that’s what coaching is,” he said. He is thankful that he grew up in a diverse school district, and with teachers who were passionate about teaching and mentoring students. He tries to emulate that in his work today. He believes that diversity plays a huge role in developing well-rounded scholars. He wants students to remember not to place judgment on others.